Our son, Aaron, has been refereering football for quite a few years. Last year, Jason started reffing, and this year they talked Mark into reffing as well. And this past Saturday, they were all part of the same crew. So of course, Christa, Jill, and I, along with the kiddos, had to go to the game and cheer on the refs. They need someone chereing them on, too, right? We were just waiting for someone to yell at Aaron, an optometrist, "Hey, Ref--get your eyes checked." Haha. It was fun to watch them. And I think they had a great time referring two games together. I made a block to enter into the QuiltCon challenge, even though I'm not attending the conference in February (insert sad face here...). 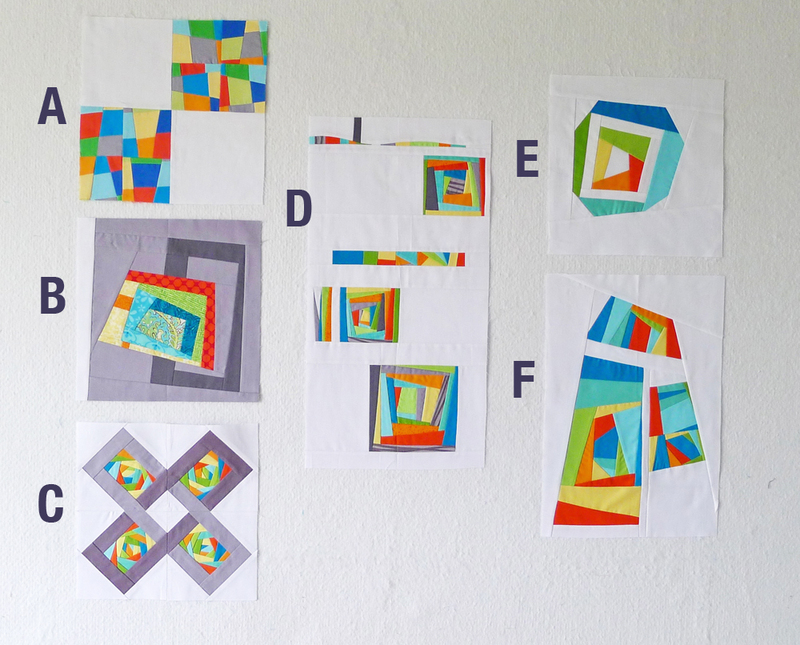 Over 300 blocks were submitted and they are being shown in groups on the Modern Quilt Guild blog. Mine (block C) was part of a group posted on Monday. If you haven't been to their blog yet,you should check it out--seeing all the amazing blocks is really fun and inspiring. Congratulations, ladies. I'll be sending you an email. Ahh, another fabulous selection of random... :oD I love that you went to cheer on the refs too, and I also think I need that cushion! And...they all three look good in black and white stripes...important!! What a handsome family of refs! Haha! Love that cartoon! 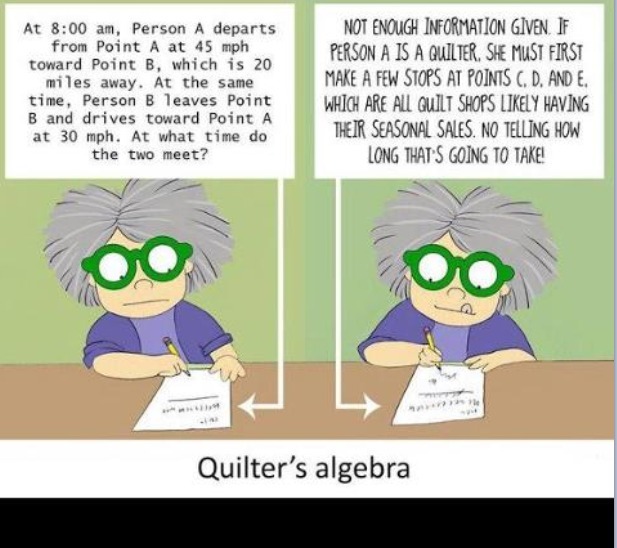 I love all those QuiltCon blocks, but especially yours. You are so truly creative. How fun for them to ref together. Neat! Congrats to the winners! How fun to see all three of your men as referees! And then to go watch their games together. Good family times! 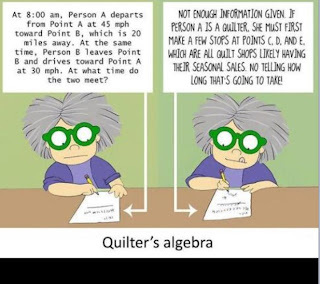 Loved the quilter cartoon--I may pilfer it some day for my blog. I love the three of your men all dressed up in ref stripes--fun you and the grandkids to get out and cheer them on (and great joke about Aaron). And yes, I wanted to be a princess when I was five. So far that hasn't turned out so well. Great picture of your guys all together! I think reffing with your family would definitely liven up the game a bit. Such cute grandkids, too! Looks like you had a fun family day out at the ball park! Your block is awesome. My favorite (I prefer symmetry!). Love that the three guys are ref-ing together! Do the kids enjoy watching the games? My husband's cousin is a college football ref, but we haven't seen any of his games. I was excited to see your QuiltCon block featured. I've been watching all the posts. So sad that you won't be attending. Was hoping we could hang out together. Looks like a whole herd of Zebras!